Buzz over Rob Bell’s new book “Love Wins” continues throughout the blogosphere, forcing some to retrench in old positions and others (mostly outsiders) to celebrate a new direction for evangelicalism. David Congdon at “The Fire and the Rose” (it’s in my Blogroll, which I recently updated) has posted a 13,000 word response to the Christianity Today review of the book, so if you want to dive into the issues in more depth, it’s a good place to start. But I also invite you to join me in actually reading Bell’s controversial book, that is as soon as I can get a copy from the library. 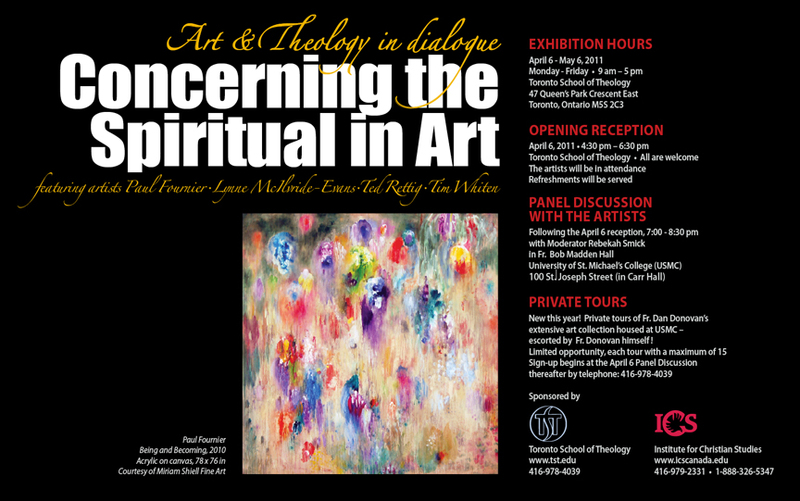 More locally, there is going to be an art show (“Concerning the Spiritual in Art,” after the Kandinsky book of the same name) on my home turf at the Toronto School of Theology. Opening night is April 6. Here are the details, and the poster is below. I’ll hopefully be there! I’m also helping put together an art show across the street at Wycliffe College in May, so I’ll get the details of that up here in the very near future.